Kayaking has long been a favorite sport for many water enthusiasts. From a peaceful day out fishing to long term camping trips it is clear to see why this has kept its popularity over the years. With seemingly endless places to go explore, many kayakers are taking their rig to the sea to rough the wild rapids and explore the beautiful open ocean. A sport better left for advanced paddlers, taking on the ocean requires you to have strong enough skills to maneuver through the changing tides and the strong currents. In order to do this properly, having the best ocean kayak is essential. 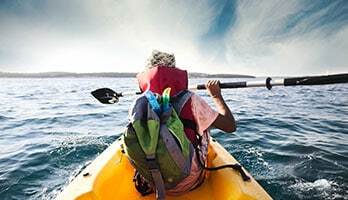 As the market for kayaks is heavily saturated as it is a sport that has been popular for a while and is maintaining its high standing, it can be hard to find the best sea kayak. Ocean kayak models will have some different features than regular kayaks. 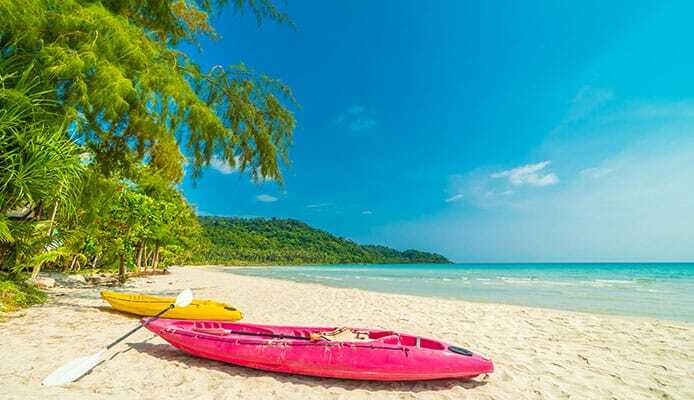 So to help you do just that, we have found the best ocean kayaks on the market to help you make an informed decision on what one is best for you. This will help you to expand your kayak skills and make you a better, safer kayaker. After all, this is supposed to be a fun sport. This open ocean kayak is a sit on top style that features two seats. The best part is the seats are removable which means you can give your dog even more room. The ride capacity is also high rated at 425 lbs. The seats also hand 3 placement options including bow, stern and the middle of the boat. 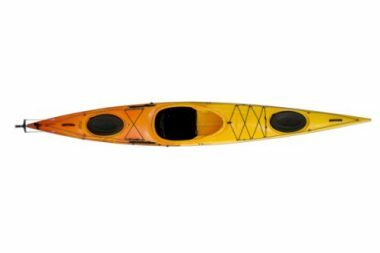 This Ocean Kayak Malibu Two tandem kayak gives you the option of where you ride which can vary depending on the conditions of the water. The cool thing is that Ocean Kayak have also placed foot wells for each seat position so you will be able to sit comfortably no matter where you are in the boat. The design of this top rated sea ocean kayak is what makes it stand out. There are perfectly placed carrying handles along with gear straps and even a skid plate. All of these things add to the durability and longevity of this boat. The skid plate ensures that the bottom of the boat stays intact even on rocky shores. Overall, this is a boat you will be happy with for a long time to come. 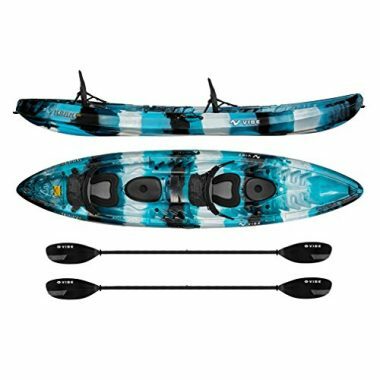 This Advanced Elements AE1012-R kayak is one of the only inflatable ocean kayaks that we’d recommend. It is made from a 3 layer double coated ripstop material. This is one of the most durable materials used on inflatables. Advanced Elements has also developed an aluminum rib system that gives the bow and stern better definition which improves tracking of the entire boat. In fact, the stern acts like a skeg meaning it will be more responsive in adverse conditions. All you need to do to get this kayak water ready is unfold and inflate it. You can then add the seat in the position you like it and you’re ready for the water. Being able to transport this in the trunk of your car will save you money on a roof rack or kayak trailer. The fact that it weighs just 36 lbs makes it one of the lightest kayaks on the market as well. The kayak is on the smaller side, coming in at 10.5 feet long. This means you will have ultimate control when it comes to dodging dead heads or parking your boat on the beach. You will get a bungee storage system directly in front of the cockpit. With some planning you can have access to your waterproof duffel bag without having to dock and exit your boat. This saltwater kayak has a lot to offer for your next trip on the sea. The lightweight design means that you will get a ton of use out of it being easy to transport from your home to the water. It also features easy to carry handles that are incredibly convenient for solo paddlers. This rugged kayak is one to write home about. Made using UV stabilized Fortiflex high density Polyethylene you won’t have to worry about barreling over the rough waters. You can also rest assured that the kayak will hold up even after extended exposure to the sun. 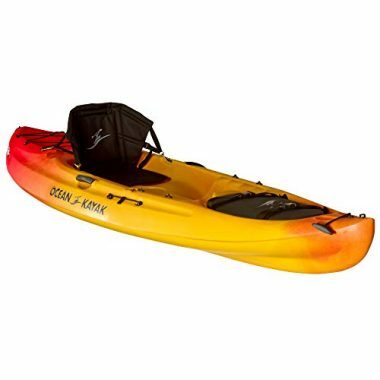 Sea Ocean kayak reviews are raving about the stability this kayak offers. 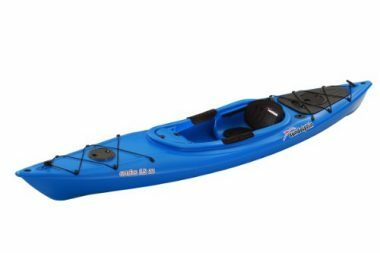 This kayak is great for providing superior tracking allowing you to paddle through the water with ease. A comfortable padded seat makes longer paddles easier. At the front of the boat you will find a small storage space that is easy to access. This is ideal for storing electronics and anything else you need at close range. A great option for those who may be interested in fishing, this kayak has flush mount fishing rod holders. It also provides exceptional amounts of storage in both the front and rear of the boat. A paddle guard allows you to safely rest your paddle across your body allowing you to be hands free while not causing any damage to your boat. Bungee systems throughout the boat help you to pack the most amount of gear along with you. If you are looking for a compact kayak for ocean use the Frenzy is the one you should look at. It is just 9 feet long and weighs in at 43 lbs. It’s so compact that it can be transported in a pickup truck or even on the roof of your car. The riding capacity is up to 325 lbs. making it perfect for you and your gear. Just like the other Ocean Kayaks on our list, this one has a great seat. You will be able to sit on this one for entire day trips in complete comfort. This kayak for the ocean has two bungee systems so you can bring all your gear with you and a dry hatch for gear that needs to stay dry. 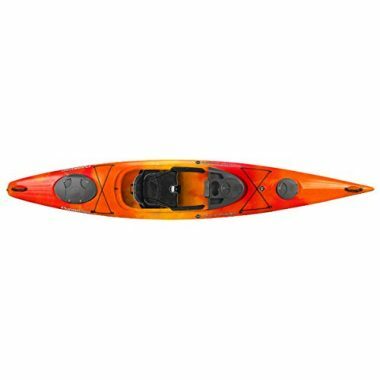 This kayak combines all the convenience of a shorter recreational kayak with the superior performance expected from a top ocean kayak. The lightweight design makes transporting this boat a breeze. This makes it ideal for shorter paddles after work. There is also plenty of dry storage space on board which makes it ideal for longer paddles. If the dry storage isn’t enough there is an on deck bungee system that will allow you to pack even more gear along with you. This kayak holds an incredibly comfortable design. With a fully adjustable seat you can choose the position that provides you with the most amount of comfort. The seat is made using a mesh fabric design which allows for superior airflow. This will work to keep you from getting sweaty on longer paddles. A front console makes this kayak incredibly user friendly. With dual cup holders and a small organization tray you can keep all your valuables along with you and store them in a convenient place. Sip a coffee as you watch the sunrise while paddling the calm inlet of your favourite spot on the ocean. These colorful boats are as fun to ride as they are to look at. Featuring knee and thigh pads allow for maximum comfort while paddling. The Slide Lock adjustable foot braces are designed to fit many different paddlers no matter their size. The comfortable Zone DLX seat is adjustable to provide maximum comfort even on longer paddles. Bow and stern hatches work to offer plenty of onboard storage for paddlers. If that is not enough you will enjoy the bungee system on the boats deck that allows you to bring even more gear along with you. Easy to carry handles work to make this kayak easily transportable. This boat is a great one to consider for short day trips and longer overnight trips. Easy to paddle this boat is ideal for a number of different skill sets from beginner to those with more experience. Perfectly combining stability in the water with expert speed this ocean kayak is a great option for all paddlers. Vibe kayaks have made one of the rare 3 person sit on top style kayaks. There are two seats but enough room for a third person - like a child. The Vibe Skipjack 120T kayak is 12 feet long and weighs 72 lbs with a weight capacity of up to 500 lbs. The cool thing about this kayak is that both seats have their own dry storage system under your legs. This gives you the ability to pack snacks or things like a camera and have it within arms reach at all times. There are also 2 rod holders and space for up to 4 if you want to upgrade later. On top of the dry hatches this Vibe Kayaks you also get a bungee system just behind the rear seat. Each seat also has a small pack that can attach to the seat. This is ideal for a first aid kit or pieces of small gear. Both people will have a paddle clip so they won’t lose their propulsion system. There is also 4 carrying handles so you can have two people carry this boat from your vehicle to the beach. Ocean Kayak makes great products. Their Scrambler 11 kayak is one of the best, and most popular, sit on top options available. It is a single seater but is long enough to have enough storage for large waterproof backpacks to be strapped to its hull. Like all their other boats Ocean Kayak makes an effort to make their boats as comfortable as possible. They do this by ensuring the seat has more than enough padding and is fully adjustable while having foot wells that have multiple positions. This boat has 3 main storage options. Two of these are bungee systems on the deck of the boat, one by your feet and one behind your seat. The third option is a 6 inch locking dry hatch. This is placed in arms reach of the seat so you can store all your sensitive electronic devices like a camera or phone so you never miss the perfect shot. The Scrambler also has a paddle keeper and a molded in cup holder. 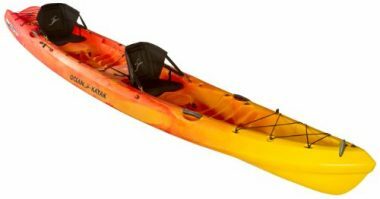 Features like a replaceable skid plate make this an excellent sea kayak for beginners. You don’t have to worry about being gentle with it as you can simply exchange it for another one. The included paddle clip is also welcomed for when you need to use both hands. This boat is also excellent in all types of water including ocean swells and calm lakes. This is one of the best kayaks for the the ocean on the market. It is on the longer length coming in at 14.5 feet. This makes it great for people who have some experience with kayak who are looking for an excellent kayak for the ocean. The Edge 14.5 LV has a slender bow and thin deck line making it great at cutting through the water with as little drag and friction as possible. A pilot rudder system keeps the kayak pointed in a straight line and easy at turning when you want it to. This is easily controlled so you have more control over your kayak when paddling through rough water. The seat has also been custom fit with an advanced padding system. In total this kayak stretches 14.5 feet long, 22.5 inches wide while weighing in at 60 lbs. The Venus 11 has been specially designed for women kayakers. It has a low center of gravity which allows the kayak to be more stable even when moving around. This is also a shorter kayak which makes it much easier to power and maneuver through the water. But with that being said, you aren’t giving up storage area. There is a dry hatch just past where your feet sit. A bungee system is also directly behind your seat which gives you quick access to your gear. The cockpit is completely open and designed for comfort. There are many cutout footwells so you can find the perfect length for you. It also enables you to move your legs in different positions throughout your journey. The seat has been set up so you can adjust it even on the water. Like we say, everything has been thought with comfort in mind. The entire kayak weighs in at just 44 lbs making it easy to put on the roof of your vehicle. After all, if it’s hard to transport chances are you won’t use it much. It also has many different handle locations making it easy to carry to the beach once you get to your launch site. This two seater ocean kayak is a great option for long treks. Its seats are incredibly comfortable and fully adjustable. This is an ocean kayak that you can bring your dog along if you want as you can remove the seat giving them ample room to move around. The Ocean Kayak Zest Two SOT also has such a high carrying capacity (600 lbs) that you can fit all your gear and your dog without worrying about reaching it. To make it even more comfortable both seats have molded in foot braces. Storage is also ample. There is an oversized tank well with a bungee system that holds all of your gear. Ocean Kayak has also made it easy to move around with their side carry handles along with ones on the bow and stern. There are also features like cup holders and two side mounted paddle holders to make especially long trips more comfortable. A skid plate on the bottom of the kayak will also allow beginners to get used to launching and docking this kayak without fear of damage. If you are looking for a sharp looking boat that provides plenty of storage for your next trip to the ocean, look no further. The Skylark is a favorite among many kayakers who are looking for a high quality boat. This boat is easy to maneuver making it an easy paddle for days on the water. Tracking smoothly through the water you can rest assured that this boat will work to smoothly get you through the water. With the compact design of a recreational kayak the Skylark goes one step further to provide stellar features that make it a great option for sea kayaking. This boat has all the efficiency to keep up with longer boats on the water. The lightweight design is easy to transport in and out of the water making it even easier to use. With both front and rear sealed storage you will be able to secure your gear inside your cabin. Additional storage is available with both front and rear bungee systems. This boat is incredibly user friendly making it a great option for both beginner paddlers as well as those with some experience. 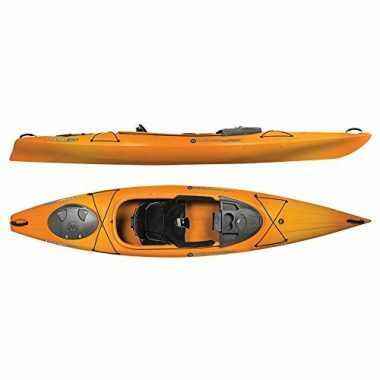 The kayak excels in stability giving you peace of mind while in the water. This is a great boat for beginners to grow into as it features more advanced technology as well. This kayak is built for extreme comfort. Ideal for bigger paddlers this boat has a wider frame and a fully adjustable seat. This boat features an impressive 350 pound weight capacity that makes it ideal for kayakers of all sizes to use. The large 14 foot length refrains from adding additional bulk and makes for a relatively easy to transport boat. The sit seat can be adjusted into a number of different positions and features a mesh fabric that provides exceptional air flow. Cup holders sit at the front of your boat allowing you ultimate comfort and convenience throughout your paddle. Thigh and knee braces help to add additional comfort to this kayak and work with the SideLock Foot Brace System to give you a comfortable and supportive position. With plenty of storage this large boat features both sealed internal storage as well as deck bungee systems that work to provide you with maximum room to bring your gear. A convenient Kayak Konsole system is great for keeping some of your favourite gear easy to reach up front such as a hot cup of coffee. 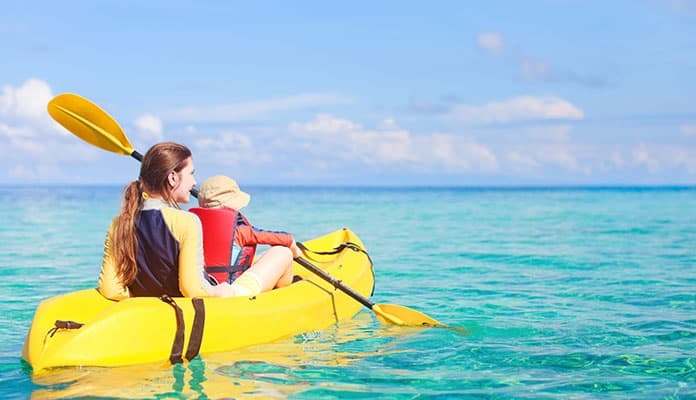 Sea kayaks are generally longer than kayaks intended for other recreational use. These kayaks should not come any shorter than 11.5 feet in length. More commonly, these kayaks should sit much longer at 15+ feet in length. This added length is important in keeping you more stable in the ocean water. They is also much easier to paddle which will be a welcomed thing when battling ocean currents. Pro Tip: Make sure that you have a way to haul this longer kayak. Oftentimes kayak trailers have length restrictions. Ocean kayaks will come in a variety of different widths for you to choose from. Generally speaking, opting for a wider sea kayak will provide better stability and is a better option for beginners. Widths around 35 inches will best suit your needs as a novice kayaker. You will want to ensure that your ocean kayak is at minimum 19.5 inches to drastically lower your chances of flipping in the ocean water. While maneuverability is not of as high of a concern in ocean waters, having a seakayak that is easy to control is incredibly important. Be sure to pay attention to past reviews of how your kayak tracks through the ocean water. When you’re plowing through some rough ocean waves the last thing you want to worry about is that your kayak won’t hold up. Having a sea kayak that is durable enough to handle the changing ocean conditions is so important. For all ocean kayaks, you will want one with a relatively low center of gravity. This will work to provide superior stability for you. When paddling in the ocean water you are vulnerable to not only the currents but also the winds. A low riding sea kayak will ensure that you are able to get back to shore safely despite any cross winds that may come. Being able to handle all the changing conditions when paddling through the ocean water is of great importance. This will help to make you a safer paddler when out on the ocean water. Ocean kayaks tend to have much smaller cockpits than other kayaks. While this may seem less desirable and far more claustrophobic, there is a reason for this. You will find yourself crashing through the waves and you will want to limit the amount of ocean water spilling into your kayak. For this reason, most often the cockpit of your kayak will be only slightly larger than the waist of the user. Your kayak style will vary depending on your use. If you are planning on riding massive swells your kayak will need different features than one that will be cruising through flat ocean waters. Also, some people love to scuba dive or snorkel with their kayaks. This will require a sit on top version rather than a sit inside as you’ll need a place for your gear. It is important to figure out your use before purchasing a kayak. 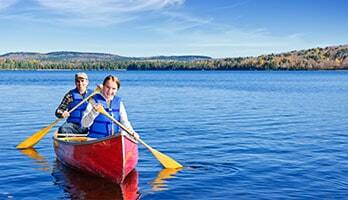 A: First and foremost you should always wear a personal flotation device (PFD) no matter where you plan on kayaking. If you are planning on kayaking in the ocean you should be completely comfortable with your rig and have some experience in the ocean water. We strongly suggest you maintain a distance that you can swim from shore. This way if you run into trouble you can simply swim to the shore. You should also know the conditions before heading out. For example, if the water is around 32 Fahrenheit you could get hypothermia if you end up in the ocean water. Being able to navigate the large swells is an essential skill you’ll need for ocean kayaking. Understanding the ocean tides and currents will also be a skill you should have before entering the ocean water. The topography of the ocean’s floor can also play a key hazard. If you are paddling by the shore rip currents can pull your kayak far from shore and even capsize your vessel. Q: What Is An Ocean Kayak? 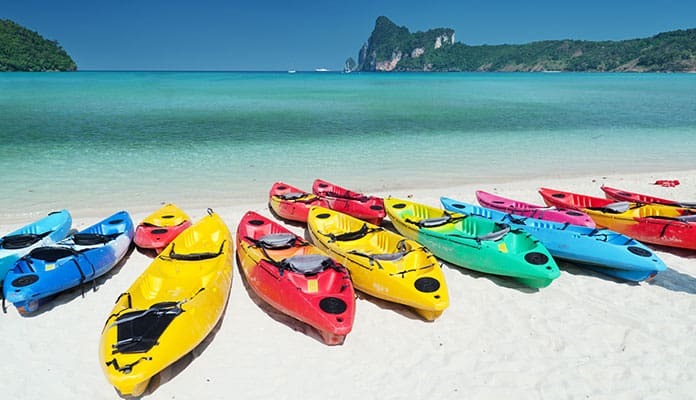 A: Ocean kayaks are those that are specifically designed for use in the sea. While you may be tempted to use your recreational kayak in the sea as well, there is a very real difference. Sea kayaks are longer than your regular kayak, tend to have lower center of gravities and have superior tracking in the ocean water. They also tend to have smaller cockpits that are designed to keep ocean water out. Q: What Size Kayak For Ocean Fishing? 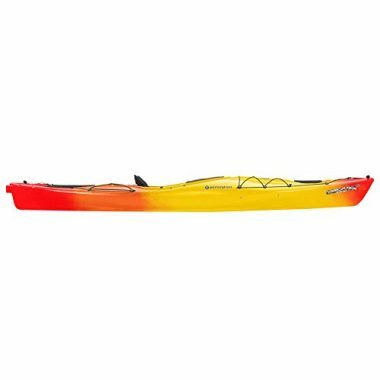 A: When looking to buy your next sea kayak you will want one that sits a minimum of 11.5 feet long. In an ideal case, having a kayak longer than 15 feet works well. You will also want your sea kayak to be a minimum of 19.5 inches in width. More commonly 35 inches will provide better stability. A: It may seem like a simple enough task but can be tricky if you’re not used to it. In fact, there is a special process to anchoring the best saltwater kayak. You will need an anchor, an anchor rope and a foam float to complete this. The smaller the anchor the better as you will have limited room to store it. Attach a nylon rope that is between 50-100 feet in length to your anchor. Typically the rule of thumb is to attach 7 feet of anchor line for every 1 foot of ocean water. You will then want to hook your foam float up to the other end of your anchor line. This will make it so that you can dump your anchor if needed and then later retrieve it with ease. To start setting your anchor up, first position your kayak to where you would like to anchor. Open your anchor so the flukes are sticking out and then cast it away from your sea kayak. Let the line run until it sinks all the way to the bottom. Then pull at your rope to make sure it sets properly. Next you will want to tie your kayak off. To do this you can use a cleat hitch or an outrigging anchor. Attach this to either the bow or the stern of your kayak in a figure 8 pattern. Pull the cleat hitch tight in order to ensure that it is secure. You may want to install a shuttle system on your sea kayak which will help you to decide whether to tie your anchor to the bow or stern of your kayak. This is a set of pulleys attached to opposite ends of your sea kayak that is looped on pulleys and attached to your anchor line. This allows you to effortlessly move your line between the bow and stern as you please. Pro Tip: You will never want to anchor your sea kayak on the side as this can put you at a far greater risk for capsizing. Be sure to always wear a life vest when venturing out into the ocean as you will be managing tougher environments. Taking to the open ocean can be incredibly rewarding. There is something about the salty air that has a therapeutic touch. With that being said, ocean kayaking takes a lot more skill than your average kayak trip. This is because of the currents, tides and the vast size of the water. Having the best sea kayak for beginners designed to specifically handle these changing conditions is important. Sea Kayaks are designed to be long and stable to give you everything you need to tear through the ocean water with ease. Having the best one for your use will help to ensure that your fun day on the ocean water stays enjoyable. If you are traveling to tropical locations, you may want to bring along your snorkel gear. This way if you find a good spot in the ocean water, you can throw down an anchor and jump in for some snorkeling. Have you ever tried ocean kayaking? Do you use one of the best ocean kayaks that made it on our list? Tell us all about your experiences in the comment section below.